I'm not such a 'wangari mathai', but I try to be. I love nature. I love parks. I hate destroyers. I support putting #HandsOffOurElephants I hate killing lions. I hate anything making us have less of our big five and others. This is different, not very different though. A good railway is in construction. It'll benefit us alot. 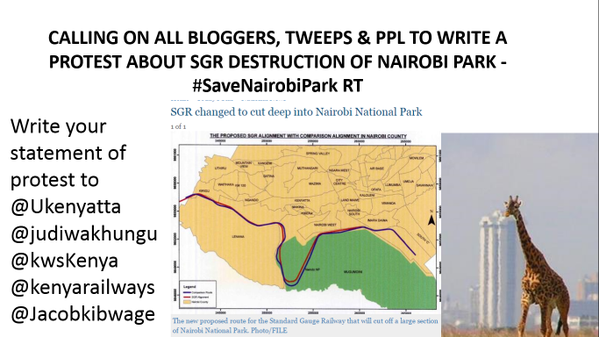 The bad thing is, though I can't verify this, that it's gonna pass through Nairobi National Park. Nairobi national park is so scenic. A rare occurrence in planet earth. A national park in a city. I really wouldn't like it to pass through it. Please, let's not do this.